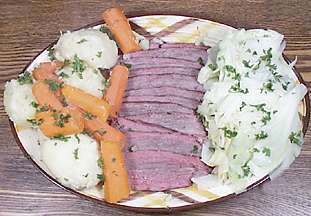 Recipe for Old Fashioned Corned Beef and Cabbage. 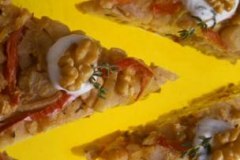 Here is a classic recipe for a St. Patrick's Day favorite entree. TIP: If your brisket came with a spice packet, you can use that instead of the mustard seeds, caraway seeds, peppercorns and coriander. Place corned beef in large stockpot. Wash orange, with peel on, then roll around on the counter, pressing down to release the juice inside. Push whole cloves into the orange, scattering them randomly. Cut orange in half, gently squeeze some of the orange juice onto the corned beef and place clove studded orange halves in the pot. Sprinkle spices over meat, then add enough water to cover. Bring to a boil, reduce heat, cover and simmer until beef is tender, about 3 hours. Drain.